A confident but inexperienced cat is certain she has scared all the mice out of her house, but things are not always as they seem. 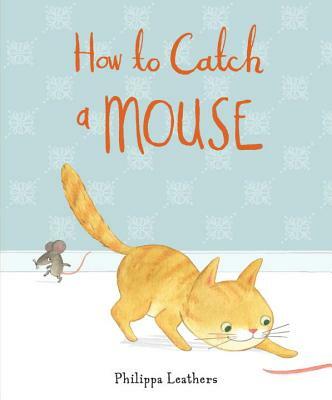 Clemmie the cat knows everything about how to catch a mouse, and she would prove it, too—except that she’s never actually seen a mouse. Perhaps, she thinks, they’re all afraid of her. But wait . . . is that a pink tail, or a dangling ribbon? A whiskery nose, or a spider’s legs? Kids will love spotting the pesky mouse throughout this sprightly picture book and will root for Clemmie to discover the mouse under her nose once and for all. Philippa Leathers is a freelance animator and illustrator, as well as the author and illustrator of The Black Rabbit. She lives in England with her husband and their two daughters, two rabbits, and a gray tabby cat named Emmi. Emmi knows how to catch a mouse, but luckily for the mice, she prefers to curl up on the bed for a good nap. The handsome pencil and watercolor illustrations (combined digitally) are clean and crisp, with golden little Clemmie contrasting against the white space and gentle background hues. The cute factor of the mouse is ramped up by its increasingly amusing disguises, but it’s Clemmie who steals the show, whether proudly smiling while declaring her superior mousing skills or rearing back in surprise at the discovered mouse. Kids and adults alike will find Clemmie a charmer. British author-illustrator Leathers' overconfident kitten will easily win hearts. Storytimers and lap-sit listeners will enjoy spotting the sneaky, smart mouse, who's always just ahead of the appealing feline heroine, disguising each physical feature as the kitten chases the look-alike. Fun for reading aloud, this picture book gives children the pleasure of keeping a secret from the main character or calling it out to her. A sweetly funny tale for storytimes or one-on-one read-alouds.